Babblings of a Mommy: Lia Sophia Spring/Summer Giveaway! Happy Thursday my pretties! I have a fabulous giveaway for you brought to you Dana, an independent Lia Sophia advisor. Dana wrote me the sweetest email a few weeks ago telling me how much she loved my blog and lucky for you lovelies she has agreed to do a giveaway! To celebrate the fab spring/summer collection Dana is generously giving one jewelry lover an item of their choice!!!! Woot Woot! (Must be $100 or less and open to US residents only.) To enter to win simply follow the instructions in the rafflecopter widget below. Jody's Baubles is such a gorgeous piece...you get so much versatility with this piece. Pair it with jeans for a daytime look and then with a dress at night! 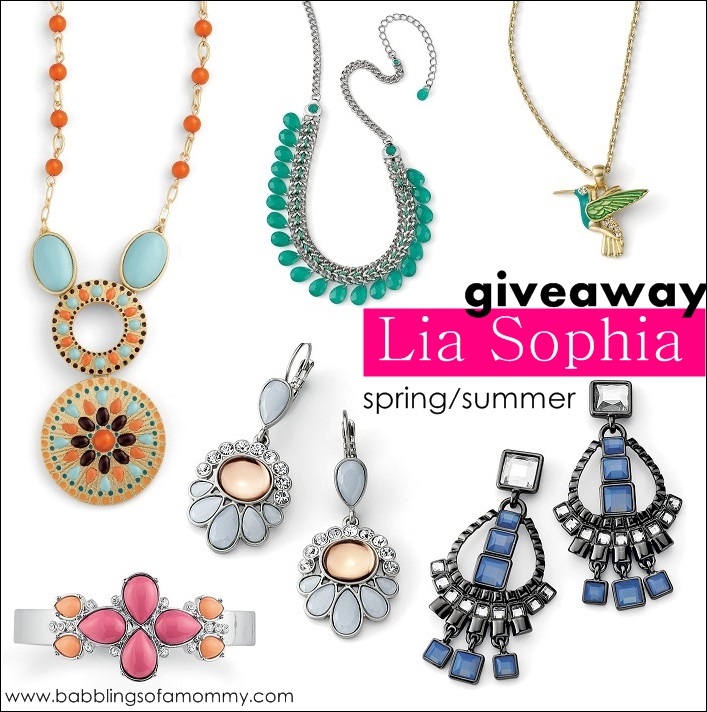 I looooooooooooooove Lia Sophia jewelry! PICK ME!!!!! WOW!!! Gorgeous collection! I Love the Contrary Necklace! One of my personal faves!! I like the Ravinia necklace. Very feminine! I love the fairest of them all earrings. And it looks even BETTER in person! I love the silver chime earrings. It's on my wish list! I love the Sea Scroll Earrings. Love the Improv Necklace (Style 31L04)! It goes with everything! There are so many things I like! I'm going to say the Menagerie Bracelet, 1C050! So many lovely things. I like the Sherbet bracelet, Waterloo & Uptown necklaces. I like this brand, love all the necklaces and other items! Cute stuff! The full bloom necklace is just so fun! I love the Caspian Sea necklace! I love too many things to just pick one...lol! But I would pick the promenade ring or the love ya bracelet! I love the Chantilly Necklace, The Charmed one necklace, the class act necklace.... honestly, I could just keep naming them all! So much wonderfulness! I adore the Lake View Necklace - but it cost considerably more than $100 - so my second most favorite is the striking Amazonia Necklace - the color is amazing! I love the Little Bit Necklace. I'd pick the Glaminator necklace - it's so cool! I like the FULL BLOOM NECKLACE. The Sherbet bracelet is so cute! Would love the Raise the bar necklace in gold! I really like the Silver Medal Necklace. i love the adrift ring! I like the meadow necklace and the raise the bar! I adore the chic "Four-tet Necklace" =)!! The site is currently undergoing maintenance so I can't browse for myself, but I love those gunmetal earrings in the top photo! HELLENIC RING, it's too beautiful and my number 1 choice! I would choose the Meadow Necklace, Style 34319.